I decided to just use the good old wacky cake recipe for all of this. I have made the chocolate wacky cake many times and it always turns out well but I haven't tried it plain which I needed for the bun layers. I just omitted the cocoa and added a bit more flour, increased the vanilla and added some almond extract. It tastes great but the texture isn't as nice as the chocolate for some reason. Then I just made the regular chocolate wacky cake for the soy patty! 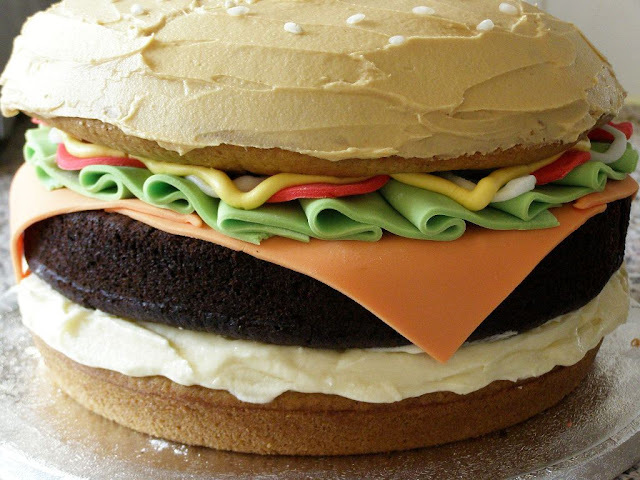 The 'mayo' is vanilla buttercream as is the mustard with yellow food colouring. 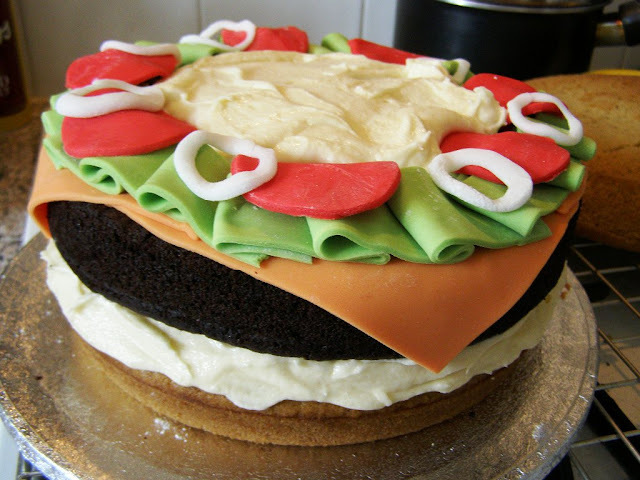 The lettuce, tomato and cheese are made from ready coloured ready to roll fondant and the onion rings from plain fondant. Then I iced the bun in vegan cupcakes take over the world's peanut butter frosting - perfect colour and the taste goes very well with this. 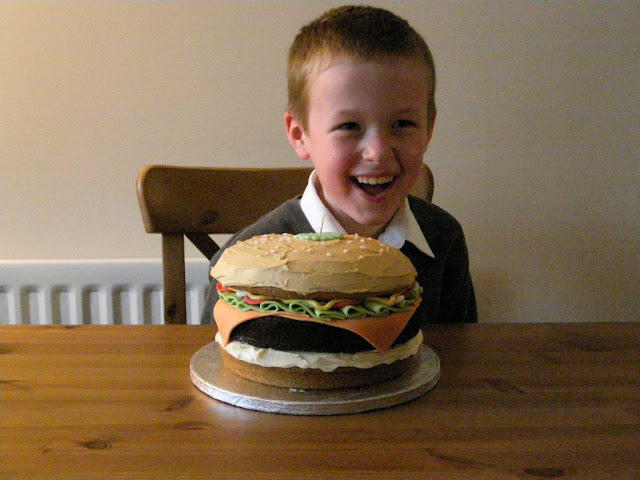 Makes 1 mahoosive burger cake! Preheat oven to 180C (350F). Grease and line one 8" cake pan with baking paper on the bottom. You will also need a bowl that looks like a bun that will fit whatever size cake pan you use. I was very lucky in that my pasta bowls which are oven safe fit over the cake pan with the sides coming down like a bun so used that. Whatever you use grease and flour it as it will be too awkward a shape to line with paper. Combine all dry ingredients and wet ingredients and keep separate. Make a well into the dry and add the wet stirring until just combined. Pour into the prepared pans making as even as possible. Bake for 30 minutes or until toothpick inserted comes out clean. Let cool in pans on rack. When time to remove, first cut off any domes with a serrated knife and then run a knife along the edges and turn out onto rack. Remove any paper. Grease and line the bottom of another 8" cake pan then follow the directions for the bun layers. Beat the fats together then slowly add the icing sugar and vanilla, add some milk as needed to get a good spreadable frosting. You won't need all of this, it makes extra for the mustard and if you wanted to add ketchup too. Beat the fats together until smooth then slowly start adding the icing sugar and vanilla. Add milk as needed till you get a smooth spreadable frosting. **2010 Edit - I went to go buy this again to make Finn another 'fun' cake for his 8th birthday and the brand here in the UK has now changed companies and is not only no longer vegan friendly but not even vegetarian! You can still make this vegan though by buying read made white fondant and colouring it yourself with vegan colours. 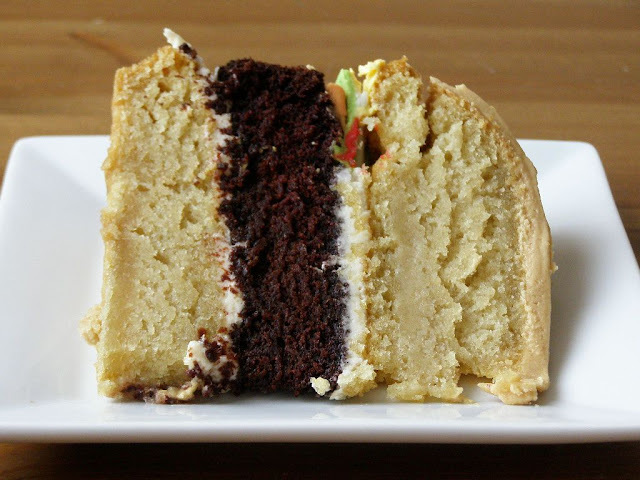 When the cakes are cool and you have sliced the domes off, take the bottom bun layer and place on a serving plate. Top with a generous amount of vanilla buttercream for the mayo. Top this with the chocolate cake. For the 'cheese' I kneaded together some yellow and red coloured fondant then rolled out thin. I didn't want the fondant to cover the whole cake as it would be too much so I rolled it out to a square then cut that into 4 even sized triangles. I then placed these over the cake to look like it's just melting. For the lettuce, I just rolled out some green already coloured fondant, cut it into strips then placed it along the edges folding it as I went. For the tomatoes, I rolled out some red already coloured fondant and cut out circles with a cookie cutter, placed them over the lettuce, again, just along the edges. For the onion rings, I just made them out of plain fondant and placed them over the tomatoes. Next, I added quite a lot of yellow food colouring to the remaining buttercream, you'll need to add more icing sugar to thicken it up, put it into a piping bag with a small plain tip and pipe your mustard along the edges. Now, the bun goes on top, spread it with the peanut butter frosting and I topped the bun with raw risotto rice. Real sesame seeds would have been too small and these gave the shape and look of sesame seeds but at a size better suited to the bun! Just make sure of course you remove them before eating. Although I was thinking pine nuts would have a similar shape too, although maybe a bit too big. I also made a little pickle with some leftover green fondant and placed that on top with a toothpick. I am in awe of your cake skills! out of making this cake for birthdays or out of teaching people how to make it ! wow! that is amazing. I am gonna tell me hubby I expect one of these for my birthday! That is the most amazing cake I have ever seen!! He looks absolutely delighted with it :) You have skills! My son also Finn, also vegan and also 8 wants this for his birthday next year! 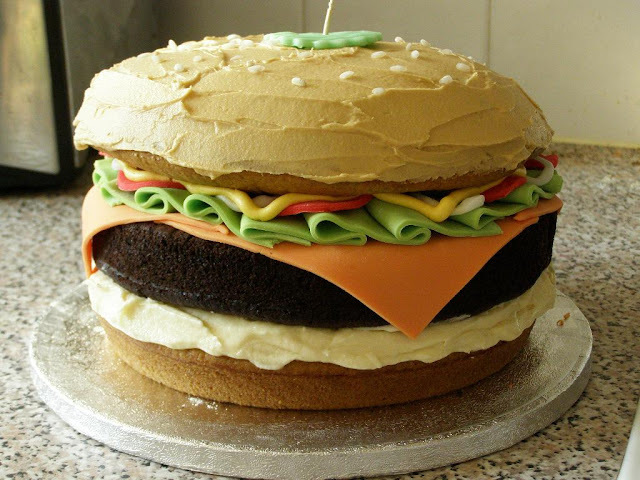 I am going to make this for my little sister's birthday...I can at least then pretend that she's eating vegetables! Debbie this case is STILL awesome! Hi Rachelle! Thanks so much :-) Not sure where you are located but in the UK/Eire you can buy vegan ready made fondant in the major grocery stores. The ready-coloured type I used to make this is no longer vegan, in fact it's not even vegetarian now! But it can still be made with plain white fondant but you'll need to knead in some food colouring, which makes it a *little* more time consuming. Hope you can find some and Happy Birthday to your son! !